To Tribute Summon this card face-up, you can Tribute Continuous Spell/Trap Card(s) you control, as well as monsters. Unaffected by the effects of cards with the same card type (Monster, Spell, and/or Trap) as the original card type of the cards Tributed for its Tribute Summon. Once per turn, during either player’s turn, if you control this Tribute Summoned monster: You can banish 1 Continuous Spell/Trap Card from your Graveyard, then target 1 other card on the field; destroy it. Master Piece, The True Dracoslaying King comes in at #2 for Top Yu-Gi-Oh cards of 2017.
banish a Continuous Spell/Trap and bam! A solid one-for-one that disrupts your opponents plays and forces them to play conservative depending on the ammo in your grave. Even without that ability, Master Piece has 2950ATK/DEF and has the benefit of being a LIGHT and Level 8. Master Piece does have his power capped if it isn’t Tribute Summoned, but with the ease he has to be Tribute Summoned there’s little chance of the opponent giving up their Master Piece just to Special Summon it later. This cap on his power is a way to balance out how powerful Master Piece can be once Tribute Summoned. ANY deck that runs enough Continuous Spell/Trap cards in their Main or Side Deck can use this card and should consider using it. 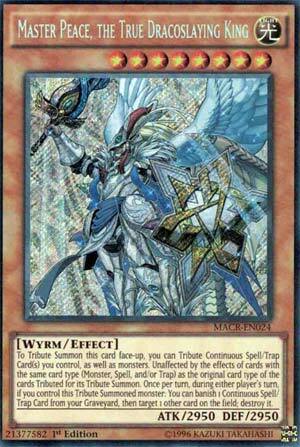 Any Pendulum deck, True King, True Draco, trap-heavy decks, Wyrm decks can use it as well, it being a Wyrm type. Fairy decks could tech it as well. Top 3 time, and we start the Top 3 with one of the best Boss Monsters ever printed, from Maximum Crisis, here is Master Peace, the True Dracoslaying King. Master Peace is a Level 8 Light Wyrm with 2950 ATK and DEF. Level 8 is great for Trade-In, though you should never use that with this in my opinion. The stats are great, and the attribute is good. Wyrm has some extra benefits, but not too much. You can Tribute Summon Master Peace using Continuous Spells or Traps, which the True Draco deck is full of. Master Peace is unaffected by whatever types you used to tribute him (Monster, Spell, Trap). Very annoying protection effect to deal with. Also, if you have an out to this guy, Master Peace can just banish a Continuous Spell/Trap from the GY to destroy it. So it is hard to out, and can destroy almost anything that can out it. The card is annoying to deal with, because the effect is so amazing. Honestly think this should of been banned with Diagram like what the OCG did, the card is very good, despite the True Draco deck not being as consistent as it once was with Ignis Heat and Dinomight Knight taking hits.